Motorcycle rentals Europe, motorcycle for rent in Bulgaria. Motorcycle rentals in Europe » Motorcycle rental in Bulgaria, Romania, Greece, Italy, Spain, Portugal, Montenegro, Croatia, Germany, Austria, France, Albania, Turkey, Macedonia, Serbia, United Kingdom, Ireland, Norway, Finland, Poland, Ukraine, Czech Republic. Motorcycle rental deals - BMW, Honda, Suzuki, Kawasaki, Yamaha, KTM, Aprilia, Ducati, Polaris, Ski Doo, Bombardier. Rent motorcycles - enduro, dual-sport, adventure, urban, street, sport bike, road, cruiser, touring motorcycle, scooter, atv, bicycle, snowmobile. The motorbike rental section of Motoroads.com is one of THE MOST TRANSPARENT and COST EFFECTIVE online booking engines. One of the greatest features of our reservation system is the Мotorcycle Rental Calculator which calculates your exact rental rate and transparently displays all costs included in your booking. NO HIDDEN CHARGES. You can easily add a certain motorbike hire quote to your favorites and retrieve it when you need to. Our Мotorcycle Hire Search naturally presents to you all motorcycle rental models classified by categories and brands - BMW, Honda, Suzuki, Kawasaki, Yamaha, KTM, Aprilia, Ducati, Harley Davidson, only a click away from the detailed photo, price and text presentation of each motorcycle. All motorcycles are disposed in different rental locations across Europe - Bulgaria, Romania, Greece, Italy, Spain, Portugal, Montenegro, Croatia, Germany, Austria, France, Albania, Turkey, Macedonia, Serbia, United Kingdom, Ireland, Norway, Finland, Poland, Ukraine, Czech Republic. You can rent everything via Motoroads.com - enduro, dual-sport or adventure motorbike, urban, street or sport bike, road, cruiser or a touring motorcycle. We also offer, all kind of professional motorbike gear, accessories and equipment rental in order to make your motorcycle adventure safe and enjoyable. 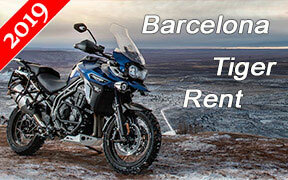 Motoroads offers 24/7 motorbike rental services in Europe. Your booking confirmation is handled online, instantly. All credit card payments are processed on a secure server by a reliable third party processor and your personal data stay strictly confidential. We reward our returning customers with up to 20% discount. If you haven't received your discount coupons yet, please contact us here.